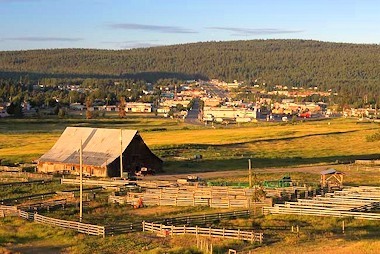 Located in the heart of the South Cariboo, 100 Mile House, BC, is the site of one of the earliest roadhouses on the Cariboo Wagon Road that serviced British Columbia's Cariboo Gold Rush. The community of 100 Mile House received it's name because of it's distance from the original Mile "0" in Lillooet. Many years later, 100 Mile House remains a welcome stop for travellers on BC's Cariboo Highway 97 offering a variety of lodging and tourist services. Try a visit to Centennial Park, one of the prettiest spots on earth! A great place for a picnic by Bridge Creek. Nestled in a valley overlooking Bridge Creek, 100 Mile House has become a year round recreational playground,including some of the world's finest cross country ski trails. Summertime brings camping and trout fishing enthusiasts to the hundreds of lakes in the surrounding area. Highway 24, between 93 Mile and Little Fort is known as "The Fishing Highway" and provides access to some of the world's best rainbow trout fishing lakes, plus a large number of BC's best fishing resorts, guest ranches and wilderness lodges. Main Industries: Lumber mills; log home building, ranching, outdoor recreation services. Access: 80 km (50 mi) north of Clinton, on Hwy 97. 116 km (72 mi) north of Cache Creek. Located on Hwy 97 the major north/south route between Vancouver and the northern communities of BC, Yukon & Alaska. Hwy 24 runs east/west from the Yellowhead Hwy 5 and joins Hwy 97 at 93 Mile, just south of 100 Mile House. 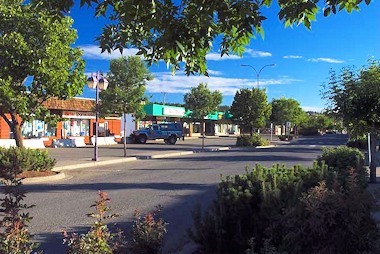 This is a relaxed and scenic circle drive for those who wish to connect with the main route from Kamloops and the Okanagan to the Rocky Mtn cities of Banff and Jasper. Hwy 24 travels through the Inter-Lakes District. Rolling hills, grassy fields with stands of aspen, emerald blue lakes with secluded resorts, guest ranches, lodges and campgrounds. And of course, some of the hottest rainbow trout fishing in the province. 100 Mile House is served by both BC Rail and Greyhound Bus Lines. The 100 Mile House airstrip is open to private planes. A larger airstrip is located at nearby 108 Mile. Campsites: There is a municipal campground on the hill above the waterfalls. Easy walking trails follow the creek valley into Centennial Park. Access is from the Horse Lake Road. In addition, there are many private campgrounds at the outlying lakes, including some beautiful provincial parks with overnight camping. Recreational Facilities: 18 Hole PGA rated golf course at 108 Mile; 9 hole golf course at north end of town; Mt. Timothy Downhill Ski area; cross country ski trails; curling and skating arenas; bowling lanes; playing fields; rodeo grounds. Local Attractions: Original BX stagecoach; Centennial Park & waterfall; Bird Sanctuary;.